We could see the villa, bisque coloured stucco and red tiled roof, for a long time before we arrived at the winding cypress-lined drive. 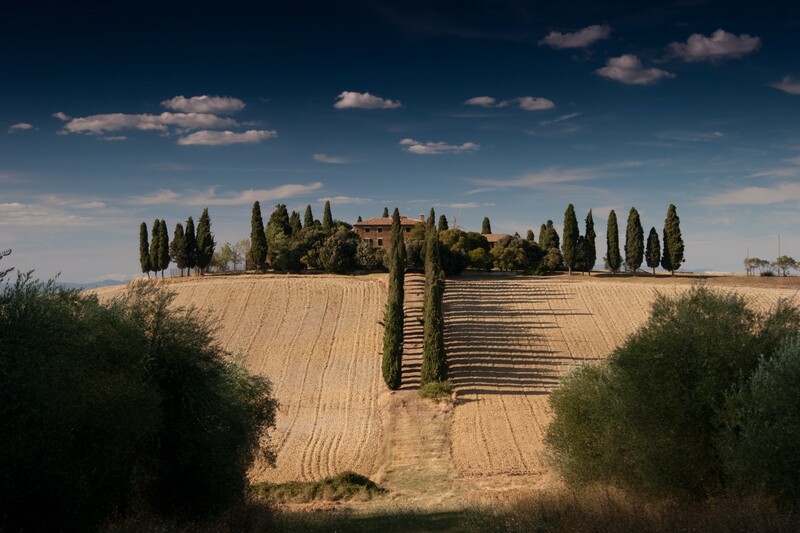 Like many Umbrian farms, it had pride of place on top of a hill flanked by fields of vines heavy with fall’s grapes. The motor coach bounced up the dirt drive as far as it could go before offloading us to walk the rest of the way. The sky was high and blue and the sun was already hot. Our host welcomed us and we entered under an arbour of shade on a lovely stone terrace. He was retired from his career in North America and had returned to his native land to make wine, cheese and cured meats. While our sumptuous lunch was being prepared, we explored the small barnyard with goats and chickens and horses. Lunch was an array of the farm’s specialties with proud descriptions of each salami or type of wine. A discrete price list and shipping form was offered and many left looking forward to what would await them on their arrival home. After lunch in the full heat of the afternoon, some chatted in the shade of the wisteria and the rest of us dipped our feet in the sparkling pool. We were a bit surprised, but secretly envious of the one who couldn’t resist and doffed her clothes and slipped into the cool water. Experiencing a culture and its food through the intimacy of agrotourism hospitality is not just a treat but a shift in perspective that is therapy in itself. Mediterranean hospitality is like no other and to sit at a table covered with simple but delicious dishes with ingredients fresh from the garden — recipes handed down through generations — you understand the culture in a much deeper way. Men like our ‘retired’ host in Italy or, as in Greece, young people who have lost jobs in the city during the crisis, have returned to the family land. They are blending tradition with technology and offering that back to a traveller, weary of ‘hurry up’ packaged vacations. The special sauce in all this is the love of each agrotourism host for what he or she does. Farming is not a moneymaking business and nature can be capricious. Agrotourism is a win/win solution to what the world needs now, preservation of natural foods and a closer look at what we eat and how it’s produced. A sun warmed lemon plucked from the tree in the yard, halved and squeezed over wild greens you identified and picked yourself. Add a drizzle of fresh extra virgin olive oil and you have a culinary delight beyond the stars of Michelin. Last December when Canadian friends stopped at Corfu on a Christmas cruise, I hooked them up with the Dafnis family to offer a more personal view of the island. They had an enthusiastic three-hour tour like none offered by a regular guide and a visit to their olive groves and mill. They got to taste extra virgin olive oil harvested and produced specifically for its health promoting attributes. This was an inspiration for the Corfu family and they set to work to create their own oleotourism centre specialising in the olive oil experience, The Governor’s Mill, where people can now come to stay in one of their villas overlooking the sea and learn about the deeper character of the island known predominantly as a tourist destination for its beaches. On our neighbouring Saronic island of Poros, an enterprising couple, owners of a small boutique hotel Odyssey Suites remodelled their kitchen, which opens onto a terraced courtyard overlooked by villa balconies. They now offer culinary junkets, “Adventures with Cooking Ouzo” where groups book a week and have daily lessons. A highlight is a trip to their lemon and olives groves on the mainland. In the fall guests can enjoy the olive harvest and al fresco picnic. On her blog, Katarina’s Kuzina, Katarina keeps the experience alive regularly offering her traditional recipes. They say a gardener believes in the future and in describing the five-year plan, Nicolas gestures to the poured concrete slab overlooking the valley where he already sees the restaurant spilling over with visitors, children playing with the goats and chickens while those interested watch the first pressing of early harvest green olives, rich in phenols, within an hour of harvesting. Agrotourism is an invitation into a person’s passion and vision. It’s inspiring and uplifting. Agrotourism also opens the heart to the part of the self that is longing for a deeper connection with nature, with the land and the bounty of natural foods. It’s the difference of seeing a culture from afar and feeling a culture as a warmly welcomed guest. It’s a way to understand food for its nourishment to our bodies and to be rewired to seek only the most wholesome sources for the ‘real thing’ when you return home. These tours are not always exclusive but reach into the greater community of artists, crafters and local businesses who collaborate to enrich the visitor experience and the community itself. Whether you go for an extended stay and decompression week or for an afternoon excursion like my first experience in Umbria, you will come away changed. In this high tech world, we crave personal human contact and what John Naisbitt, author of Megatrends termed “high touch”. We are in desperate need to be grounded — literally — standing in nature. The growing agrotourism industry is rising to meet that need. There is an answer for stress; our stressed bodies and minds, our stressed food grown in a rush and eaten in a rush and our stressed land forced to produce with less and less wisdom from nature. The answer to high tech stress is in a grove, on a farm, by the sea or on a hilltop. There is someone there. Waiting for you. Asking nothing of you but to relax, body and soul, and let them share with you their love of this precious earth and its bounty.